Summer and lake fun seems to be synonymous with a number of Midwestern families. I grew up on the shores of Lake Erie and spent countless days and hours on the beach having fun. We would chase waves, build sandcastles, grill out, and much more. As a parent, I am appreciative of any opportunity for my kids to get outside and have fun. And if the adults can have fun at the same time? Even better. 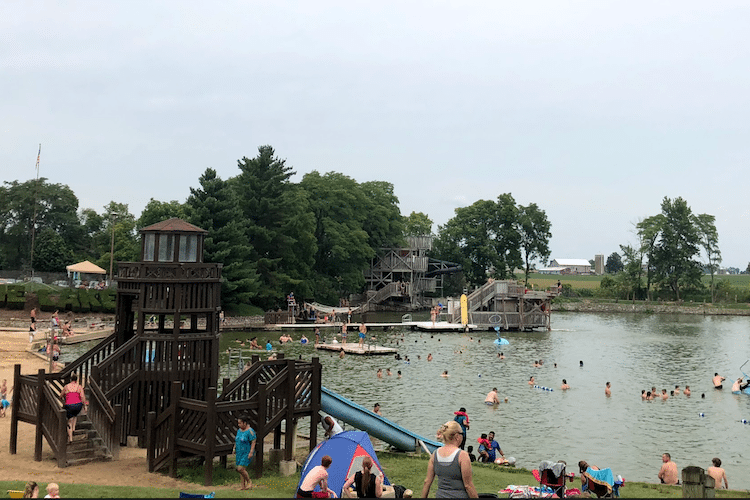 Recently, we had the opportunity to visit Pine Lake, which is located about 45 minutes south of Fort Wayne, for some lake fun. Pine Lake did not disappoint. Prices are reasonable: kids under 4 are free, kids 4 to 9 are $6, and everyone else is $7. There is a group discount for groups of 20+ (according to the website). You cannot take alcohol or coolers into the water park, but you do have in and out privileges with your wristband, so you could pack a picnic to eat by your car in the parking lot. The water park does have a small concession stand that sells hamburgers, hot dogs, nachos, ice cream, ham and roast beef sandwiches as well as pop and water bottles. But when you go to a waterpark you go for the water right? 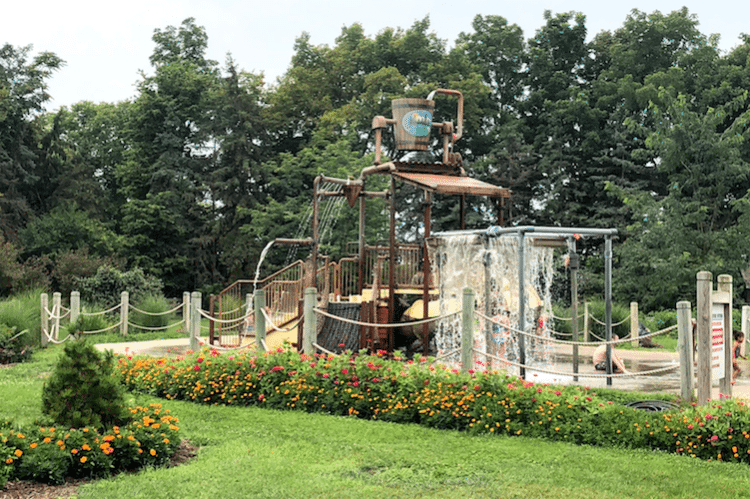 Here’s what the park offers: 6 different slides, a beach volleyball area, a lily pad section, a zipline, a beach area, a kids splash pad, a small petting zoo area, and a diving platforms with heights of 10, 20, and 30 feet. There is a roped off shallow area for swimming and a platform for diving in the deeper end of the lake. There are activities for everyone at Pine Lakes – whether you are a swimmer or non-swimmer. Floats and life jackets are permitted in some parts of the pool. If you are deemed a non-swimmer, there are specific parts of the lake that you are not allowed to enter. There are lifeguards supervising most of the areas including the slides. Most of the slides are also equipped with green light/red light systems to assist with the flow of swimmers. We experienced just about everything in the water park in 4 hours. While there is no camping on the grounds, there is a State Park (Ouabache) less than 15 minutes away from where you can camp. So if you are looking for a quick getaway or just a new and different way to experience that Lake Life, check out Pine Lake for fun for the whole family. Pine Lake is located at 4640 West State Road 218, Berne IN. Pine Lake is open every day through Aug. 19, then will be open on the weekends until Sept 3. Check out their website for more information. Creed Anthony is a husband, father of two, teacher, and writer. He enjoys quiet moments with his family – although quiet is actually a relative term. His children are 4 (the boy) and 8 (the girl) and his pride for them is without bounds. Originally from Cleveland, Ohio, Creed enjoys visiting new, fun, family friendly places in Indy. He is a Cleveland sports fanatic, comic book fan, avid movie watcher, and loves to write. In his spare time, he serves as the organizer for the Indy Dads Group. You can find Creed online as “The Captain” at Tales From The Poop Deck, or on Twitter and Instagram. He is also a frequent contributor at LifeofDad.com and the only dad blogger “endorsed” by Dwayne “The Rock” Johnson. He would love to hear your suggestions of fun events with the kids – or dates with the wife! – around Indy. Send them to him at [email protected].